Dream In Darkness: CT Anne Heading Towards the Start!! Anne has made another make to make you think and give you shivers! She is great at that! We are heading down the home stretch for the start of the challenge and here is Anne's offer to fire up your inner, shall we say, appetite?
" Mixing styles: "If it is to be creepy, there must be blood" Zetti is such a distinctive style, though I must apologise for the lack of pointy hat somewhere. 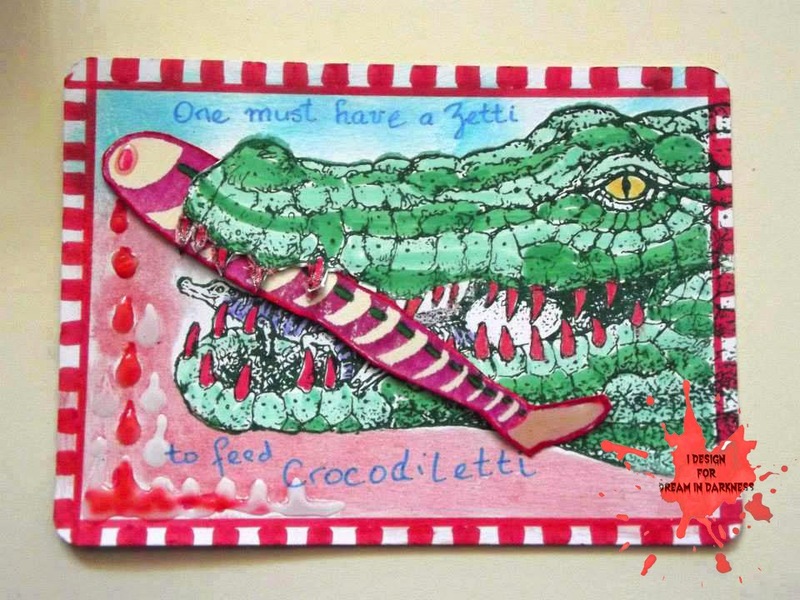 ...And "-ette" can mean miniature, so here is a croc feeding it's baby crocette. Awww, how sweet... how creepy??? Stamps are from vivalasvegas, coloured with Tombow pens. I fussy-cut between the crocodiie's teeth to slide in the separate leg. Too-simple background - daubers coloured on ink pads. The blood was tar gel. The white drips were made before colouring the ATC. Tar Gel is a clear product from Golden. Very runny, you can drizzle it like golden syrup, or get droplets like this. For red drops I added a bit of red paint to the tar gel, mixed it in and let settle a few minutes for bubbles to rise up, before drizzling down the card. Now to go off and develop some lettering skills ;P﻿"
So how many out there are getting ideas already for the start of our Dream in Darkness Challenge May 1st? Raise your hands. We see, hmmmmmm, maybe we need to "persuade" you a little more? But you don't want us to have to do that now do you? Buwahahahahahahahah! That's better! 1...2....3......4....5...ohhh, much better! Thank you so much our lovelies of the dark side!! Check back tomorrow for another post before the AWAKENING!! One can only assume the crocodile has already eaten the tall pointy hat?